Mayor Frank G. Jackson held his annual address highlighting the achievements of the past year in the City of Cleveland on October 10, 2018. 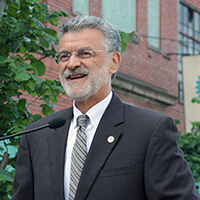 From improvements in public safety to economic development in neighborhoods, Mayor Jackson shared updates about his vision for moving Cleveland forward. The State of the City address was free and open to the public. Photos and videos were shared on social media with the event hashtag - #CLESOTC18.